In a previous tutorial, we took a look at how to cherry-pick a commit on the current branch, but one of the ancillary questions that commonly arises is how to perform a git cherry-pick from another branch. The topic of how to git cherry-pick from another branch, along with what the result of such an operation would be, is the focus of this tutorial. As with all git tutorials, this one will start off with a clean repository and an empty working directory, which means the first step is to create a new folder, which I will name git cherry-pic example. The next step is to issue a git init call from within that folder. With the repository initialized, the next step is to create three new files, adding a commit after each individual file is created. Since the repo was just initialized, all of this will occur on the master branch. We are about to git cherry-pick from another branch, and specifically, we will be pulling in the second commit, but before we do we will delete all of these files and perform a commit to put the master branch back into an empty state. Issuing a git reflog command will show the rich commit history of the master branch. Note the hexadecimal id of the second commit, 63162ea, as this is the one we will use when we git cherry-pick from another branch. We will now create and move development onto a new branch named feature. We will then create one file named zip.html and commit this file in order to create a small history of development on the feature branch. The next step is to git cherry pick from another branch to this new one, but before we do, think about what the expected result is. We will cherry-pick the 2nd commit from the master branch, namely the commit where the file named bowie.html was created. In the other branch, the bowie.html file sits alongside the abba.html file, which was created prior. What will the cherry-pick bring back? Will it bring back the abba.html and bowie.html files? Will it resurrect just the bowie.html file? Or will the command fail as we try to git cherry-pick across branches? Let’s see what happens. 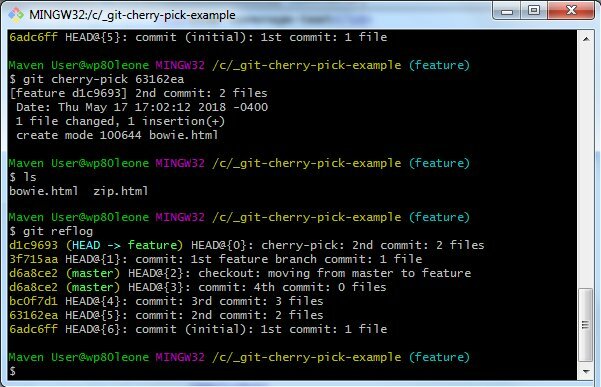 The output of the command to git cherry-pick from another branch is a single file being added to the current working tree, namely the bowie.html file. The directory listing command issued above shows two files, the zip.html file and the bowie.html file, indicating that the only change to the working tree was the addition of the second file. As you can see from this example, when you cherry-pick, what is returned is not the entire state of the branch at the time the commit happened, but instead, only the delta between the commit that happened and the state of the git repository prior to the cherry-picked commit. Needing to git cherry-pick from another branch is a common occurrence during software development cycles. As you can see from this example, so long as the hexadecimal id of the commit is known, performing a git cherry-pick from another branch is a safe and rather simple function to perform, especially if the branch doing the cherry-pick can merge the change without any clashes or conflicts occurring. Mastered Git? The next step in your DevOps journey is mastering Jenkins CI. Here are some great Jenkins tutorials that will take you from beginner to expert. Step 7 — What happens when you git reset hard and push?